When a new dish or cuisine is introduced to the UK, it’s inevitably given an analogous description that’s humorously inaccurate and ultimately unnecessary. 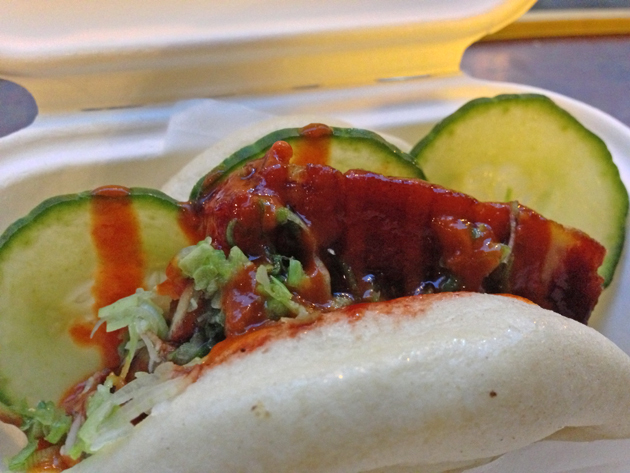 The Taiwanese dish of gua bao is a case in point. 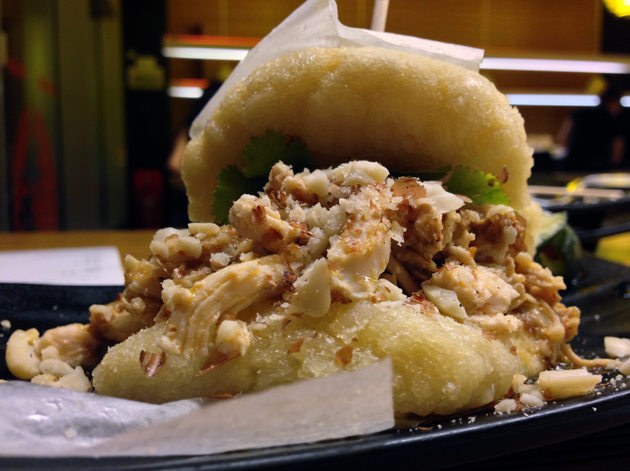 Known by the Japanese as hirata buns due to Japan’s colonial occupation of Taiwan, Gua bao are simply steamed rice flour buns sliced open, filled with roasted or grilled meat and garnished with crushed peanuts and coriander. Despite this simplicity, they’ve been described as ‘Taiwanese tacos’, ‘Chinese burgers’ and, most laughably of all, ‘Taiwanese mini-kebabs’. New Yorkers will doubtless find such nonsense laughable, since they’ve had quality gua bao for years now. Gua bao sometimes show up on the menus of Japanese restaurants in the West under the name ‘hirata buns’ – a name apparently coined by Masashi Hirata, a chef at Ippudo in New York (thanks to Bao London and reader Jman for pointing this out, although at the time of updating I’m still waiting for Ippudo New York’s press office to confirm or deny this). 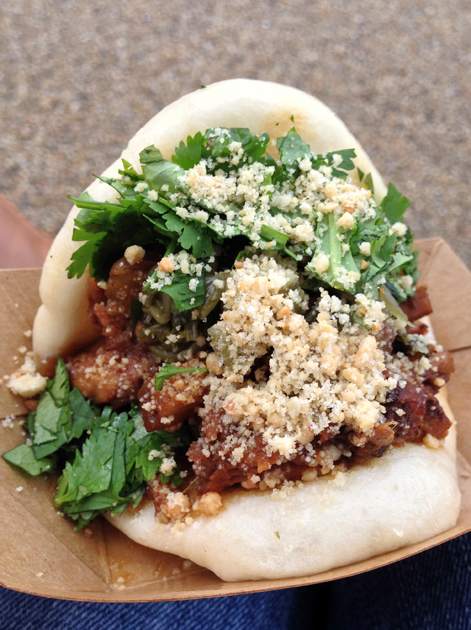 Gua bao, or hirata buns if you will, have received a lot of attention due to the launch of Flesh and Buns. This Covent Garden restaurant is from the people behind ramen joint Bone Daddies, but it isn’t the first London eatery to serve gua bao; nor is it the best either. I’ve spent the past couple weeks hunting down every gua bao in London searching for the perfect combination of soft, fluffy, slightly chewy buns filled with moist, fatty, flavoursome meat. 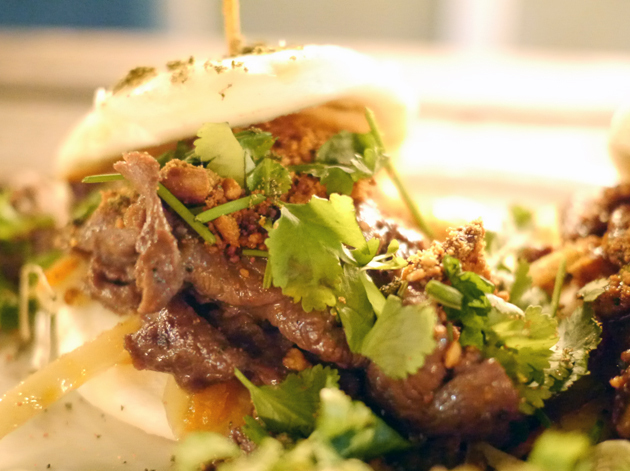 The simply-named Bao London has a small six-seater bar and a market stall that makes regular appearances at markets such as Kerb Kings Cross. 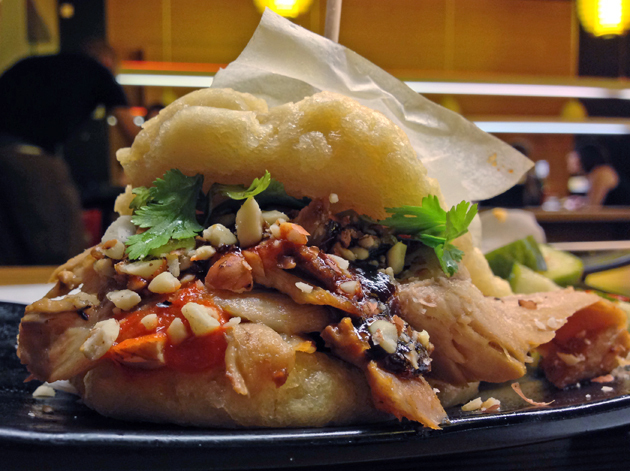 It’s well worth seeking out as it easily has the most authentic Taiwanese-style gua bao here. The fluffy, soft rice bun was filled with a small but moist and fatty chunk of tender pork along with juicy, jelly-like tendons. Some of the pork was shredded, while the rest was thickly sliced. The entire thing was garnished with crushed peanuts and coriander which only enhanced the savoury goodness. My only complaint is that the gua bao is a bit on the small side, but that just gives you good reason to order another one or to enjoy the side dishes. The pomelo crunch is the best coleslaw I’ve had in a long time, largely because it bears little resemblance to the sickly, overly creamy slop we’re all familiar with. 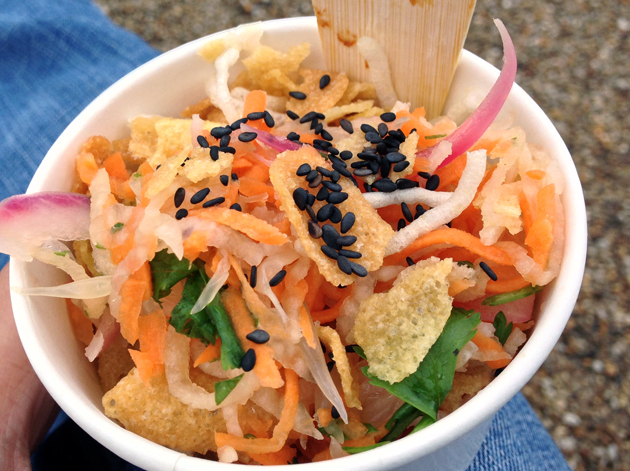 The shredded carrots and cabbage were dressed in sesame seeds, coriander and mildly sour morsels of pomelo fruit, an ancestor of the grapefruit. 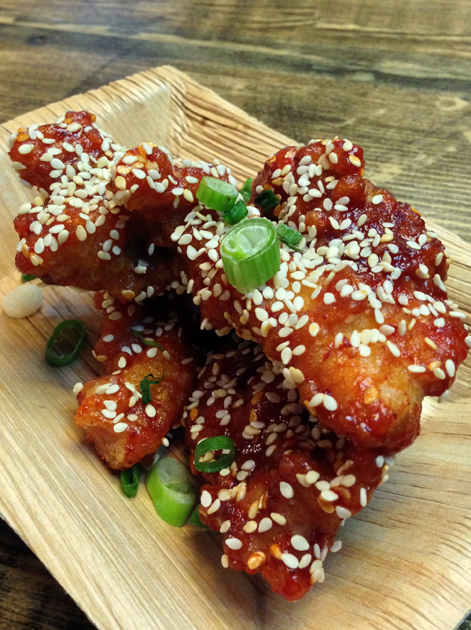 It was a very refreshing counterpart to the soy milk fried chicken bites. 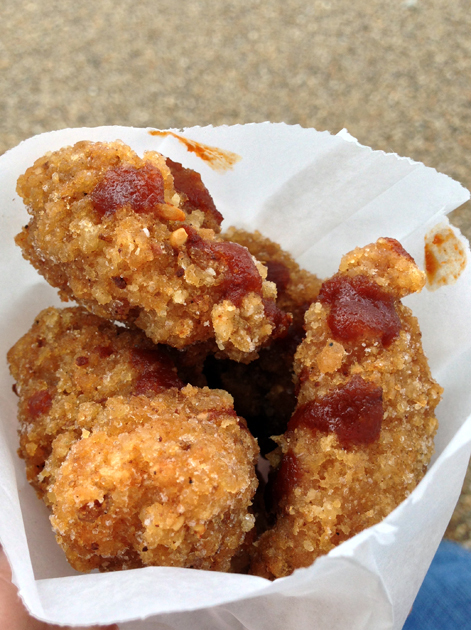 The moist chunks of fried chicken were free from excess oil and battered in a light, crisp and exceedingly moreish coating flecked with occasional hints of ginger. Even better than the gua bao itself. 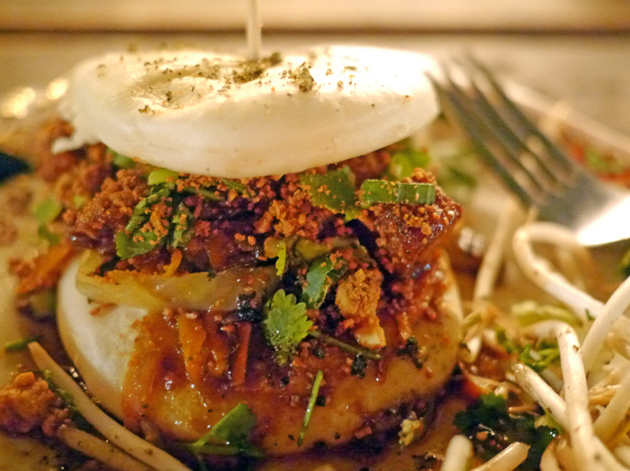 Bao London easily serves up one of the best gua bao in the capital. It’s not quite as good as the best American examples, but it’s not far off either. I didn’t have high hopes for the gua bao from Bintang. Not only are the steamed buns described on the menu as ‘Taiwanese tacos’, but Bintang itself is a pan-Asian restaurant. I find the very idea of such a thing disagreeable – attempting to master dishes from half a dozen different and distinct culinary traditions is often a recipe for disaster. Although Bintang’s buns weren’t as bad as the ones from the Japanese Canteen, the flat, stodgy buns were distinctly lacking in bounciness and fluffiness. 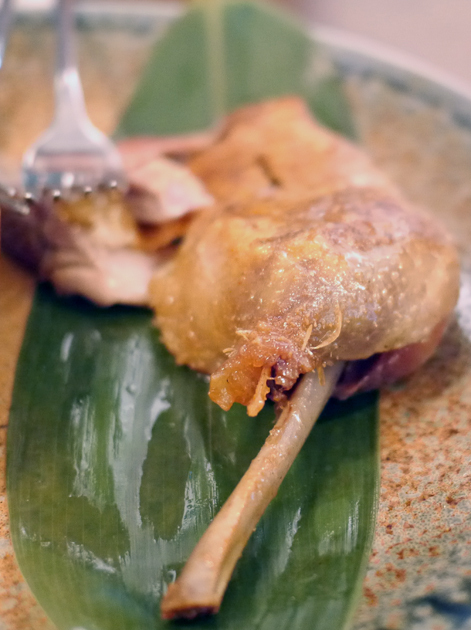 The meat used in the duck version was almost unrecognisable – characterless flecks of bitty meat served in an overpowering plum sauce. A pork option was conspicuously missing from the menu, with a beef variant taking its place instead. I was unimpressed with the takeaway-quality well-done, stir fried slices of cow, but at least they were reasonably tender and not too chewy. Considering my only source of illumination was a strip of fairy lights, I’m happy with how these photos have turned out. The tofu gua bao was the worst of the lot. Small chewy, bitty pieces of tofu bathed in a messy, sticky, salty sauce. There was so much sauce that it caused the bottom half of the bao to become soggy. It threatened to break apart, but thankfully held together just long enough for me to eat it. I feel a little bad about dissing Bintang’s gua bao. The service was warm and friendly, if painfully slow, while the backyard, with its fairy lights and two massive trees, is easily the most pleasant and picturesque place I’ve been to in Camden so far. Still, that makes the dire gua bao all the more regrettable. Flesh and Buns is unapologetically a restaurant for the young or at least those with supple, forgiving bodies. The boisterous, noisy atmosphere and the long, semi-communal bench in the middle of the dining room paired with backless stools won’t suit everyone. 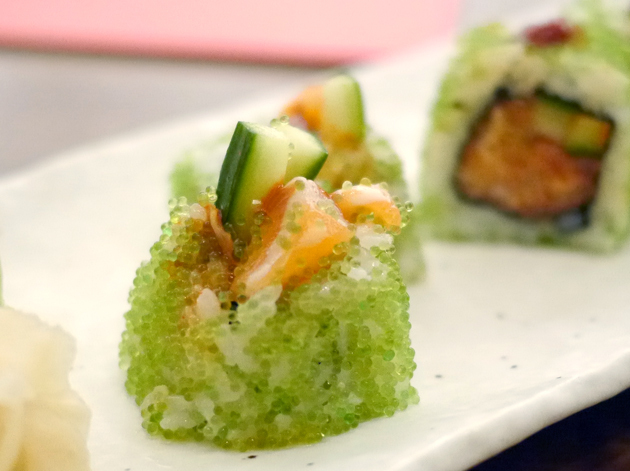 This subterranean Seven Dials restaurant serves up not only its eponymous hirata buns, but also a sprawling selection of starters and side dishes including sushi, sashimi and tataki. On our first visit The Euro Hedgie and I gorged on a trio of meaty main courses – braised pork belly, crispy duck leg and grilled sea bass buns. Each serving of meat comes with just two buns which seems a little miserly – not only are they relatively cheap things to make, but two is just woefully inadequate for some of the larger servings of meat such as the pork belly. At least the buns themselves are soft and fluffy. There is also an accompanying bowl of crudites with each meat, including lettuce if you feel like having a carb-free option. Although expecting a carb-free option in a place called ‘Flesh and Buns’ is moronic. All the meats are served with the buns on the side – it’s up to you to shred and divvy up the meat as you see fit. Depending on your point of view, this either encourages conviviality or is a cheeky outsourcing of labour to the diner. 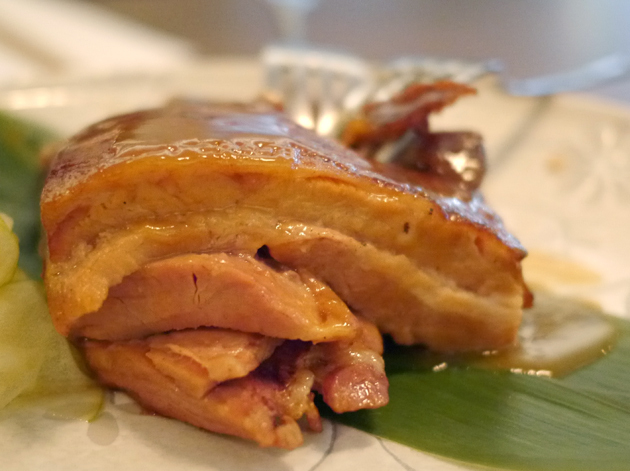 The braised pork belly was the best of our meat triple – the pork had a sweet and sticky glaze that gave way to tender and mildly fatty flesh. I prefer my belly with a little more fat, but it was still the best meat we had on this visit – it was especially well complimented by thin slices of sharp and sweet pickled apples as well as the wasabi and mustard-based sauce. The sea bass was pretty good, but it won’t surprise anyone who’s ever had a grilled sea bass in any half-decent Chinese restaurant. The taut, crisp skin and flaky fish flesh flavoured with ginger and a light soy sauce is perfectly fine on its own with little need for the accompanying coriander miso dip and tomato salsa, which were frankly rather dull and limp. 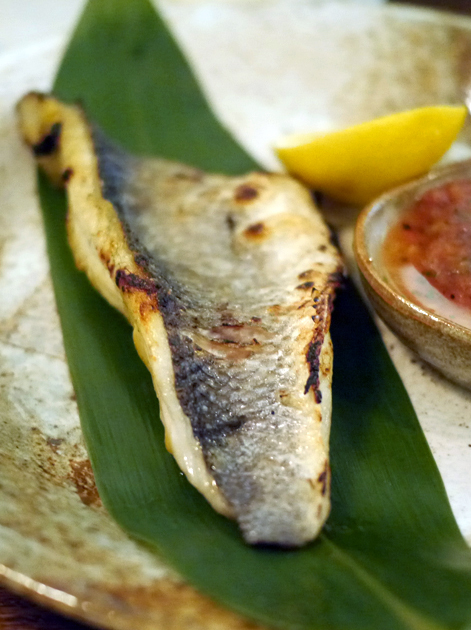 The sea bass worked better on its own rather than being eaten in a bun which tended to obscure its character. We weren’t terribly impressed with the crispy duck. The meat was too dry for our liking and was also rather bland since the leg meat was, as one would expect, desperately lacking in fat. It was livened up to an extent by the sour and fruity sweet dipping sauce (apparently a mixture of plum and soy), but there’s only so much make-up you can put on a corpse. A more flavoursome and fatty Beijing or Cantonese-style roast duck would’ve worked far better. Despite gorging ourselves on meat, the Hedgie and I still had room for dessert. The Hedgie opted for kinako donuts, where the pastry was apparently made from soybean flour. 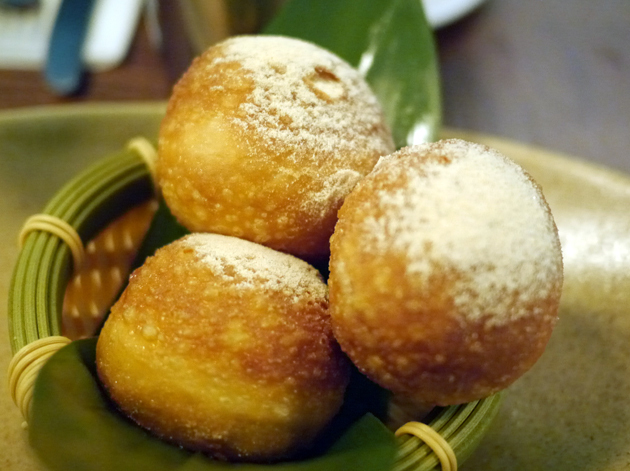 Each spherical donut was free from excess oil, but surprisingly thick and somewhat stodgy. 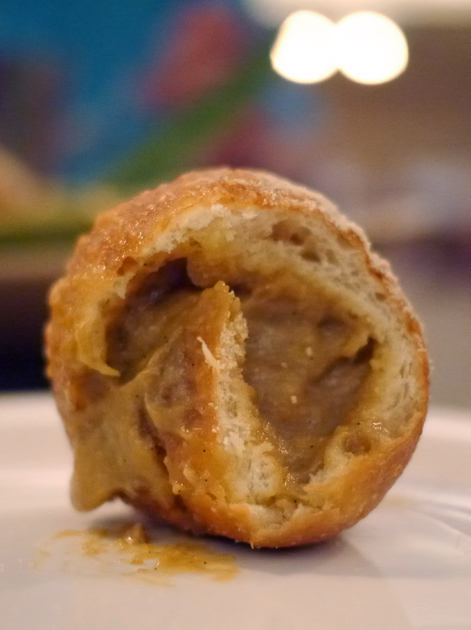 The best part of each donut was the filling of thin, sweet, caramel-like custard. The Bone Daddies sundae did little to dissuade me from the view that sundaes are desserts for children, even if it did include some ingredients that would make most spoilt, suburban Western kiddie-winks blanch in disgust. 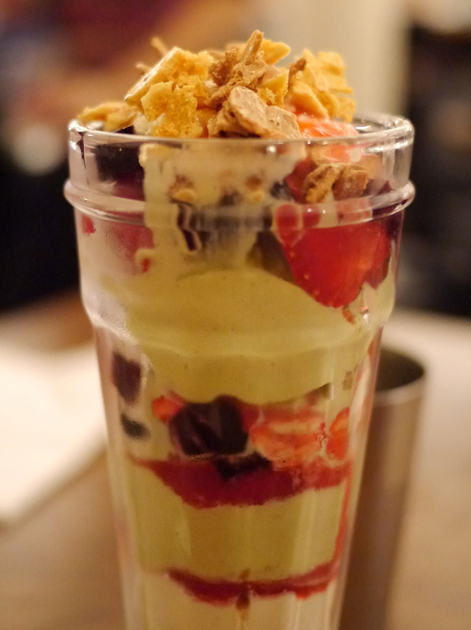 The matcha green tea ice cream was reasonably flavoursome and dotted with small bits of chewy, almost viscous honeycomb and small cubes of black grass jelly, but these elements were hard to appreciate smothered as they were under a mass of cream. 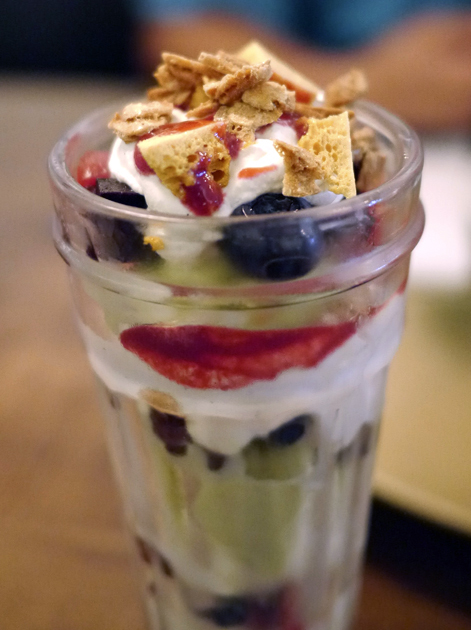 Why is this sundae named after Flesh and Buns’ sister restaurant? 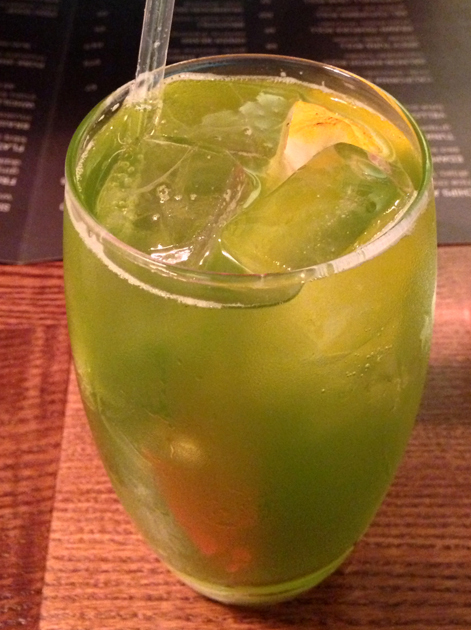 The intriguing-sounding shiso and tarragon soda tasted much like a mint julep, which isn’t surprising since shiso is related to mint. On our second visit with Rodan and Gamera in tow, we opted for a different trio of meaty bao-fillings – flat iron steak, chicken and salmon teriyaki. 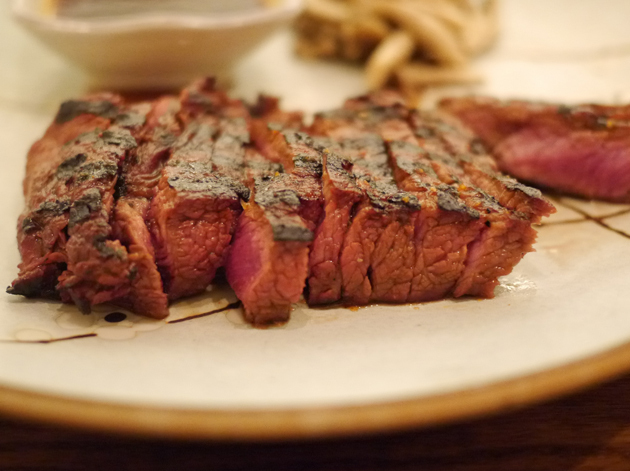 The flat iron steak cooked medium rare was tender, but bland – especially when compared to the quality of the same cut of steak from Flat Iron. 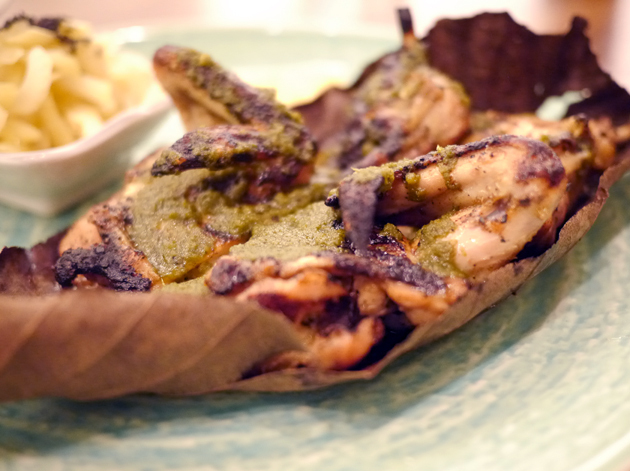 The spatchcocked baby chicken was better – charred yet moist with zesty hints. These flavours easily stood out when eaten as part of a bun, but the it was the soft, tart accompaniment of pickled celery that stole the show here. 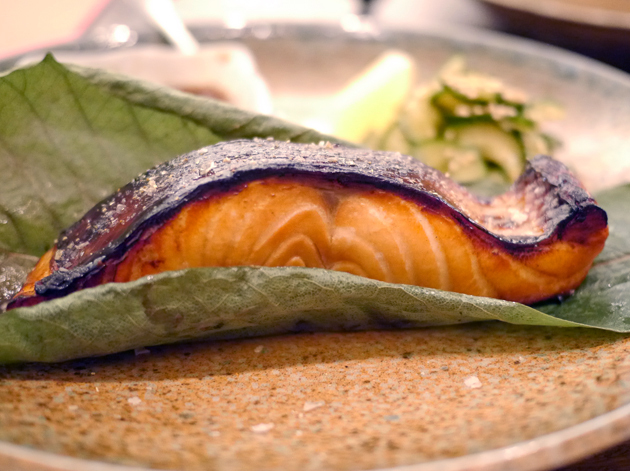 The salmon teriyaki was light with skin that managed to be both slightly chewy and crispy at the same time. However, the marinade of mirin, sugar and soy sauce was too faint to be detectable and the pickled cucumber left me cold too. Our sides varied in quality. 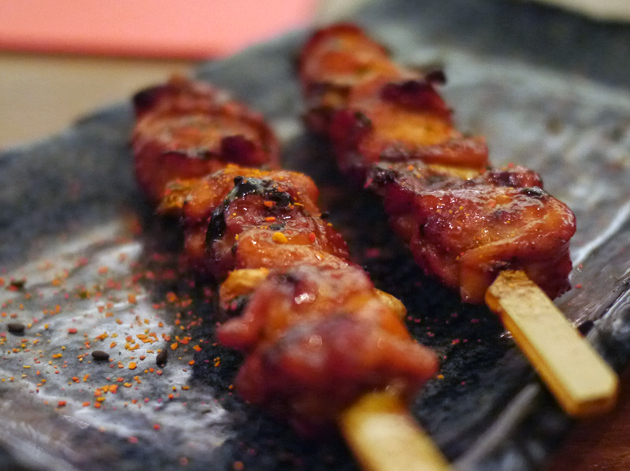 The chicken yakitori skewers were a bit dry, but their charred muskiness made up for this. 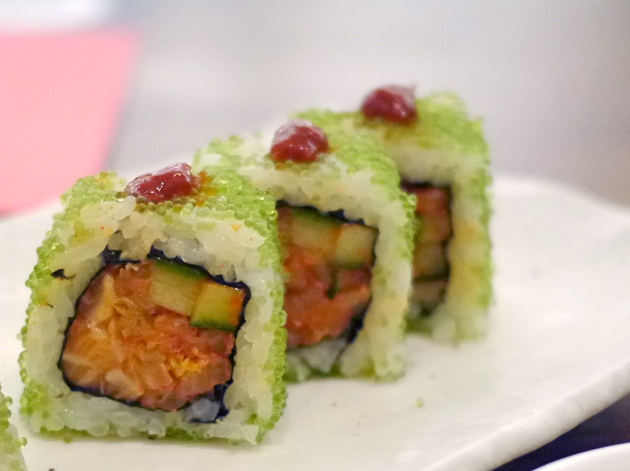 The salmon kimchi roll was wholly misjudged though – what little kimchi present was still potent enough to drown out the raw salmon. The sashimi was pretty good though – the buttery salmon and supple, meaty tuna were particular highlights (sorry folks, no photo of this one). The Bone Daddies sundae was much the same as it was before, but even that dessert would’ve been preferable to the yuzu meringue pie. 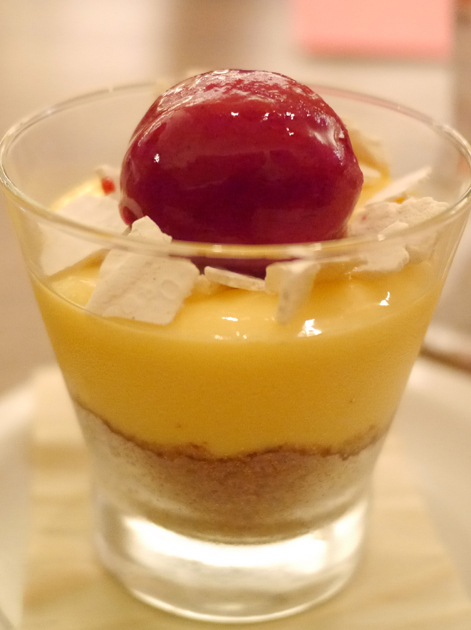 Despite the name, there weren’t enough meringue pieces with the dessert dominated instead by the overwhelming sourness coming from the lemonish yuzu custard and the overbearing tartness of the raspberry sorbet. Digging through all that lip pursing sourness to get to the loosely-packed biscuit crumb base was tough going. A shallower or a more layered construction allowing an easier mouthful of all these elements may have made for a more palatable dessert. As it was, I couldn’t finish it and that’s a rare thing indeed. The hirata buns at Flesh and Buns aren’t bad, but they’re a little overpriced and largely forgettable with the possible exception of the pork belly variant. The main attraction here is the central location and easily bookable tables. Hirata buns are only available at a select few branches of this Japanese fast food chain, such as the City location a few steps away from Liverpool Street station. 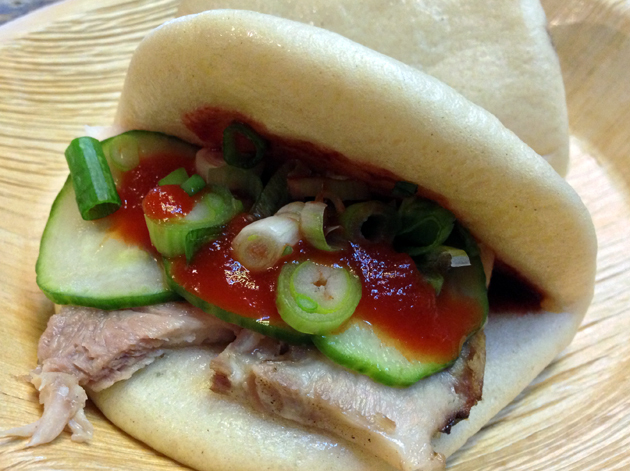 Oddly, the steamed buns are named as gua bao online, but as hirata buns in-store. In any case, the buns themselves were unimpressive – flat, dry, stodgy and far too bread-like. 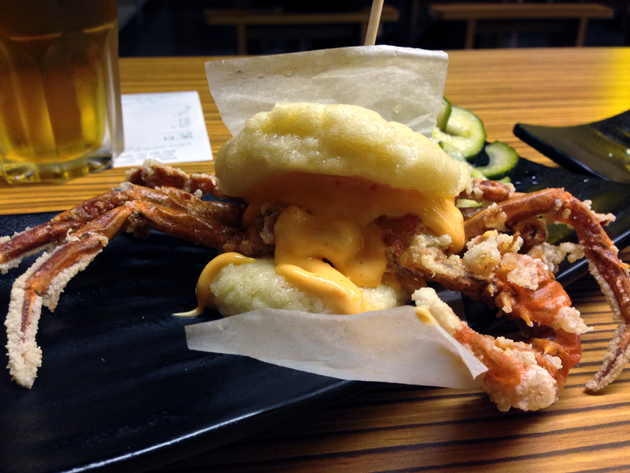 The best filling was, surprisingly, the soft shell crab. The battered crustacean, which no doubt had seen the inside of a freezer recently, was reasonably crisp and zingy if a little small. The ‘chilli’ mayo had about as much heat as a Siberian winter though. The pork belly was nothing of the sort. The thin slices of pub carvery-quality pork was severely lacking in porky fattiness and the coriander crushed peanuts didn’t taste of much either. Not even the moderately salty hoisin sauce was enough to rescue this rather drab affair. The poultry option consisted of shreds of chicken that were slightly too dry, but was rescued from dull inedibility by the spicy sesame sauce – its tart spiciness did a passable and edible impersonation of Sichuanese pepper. 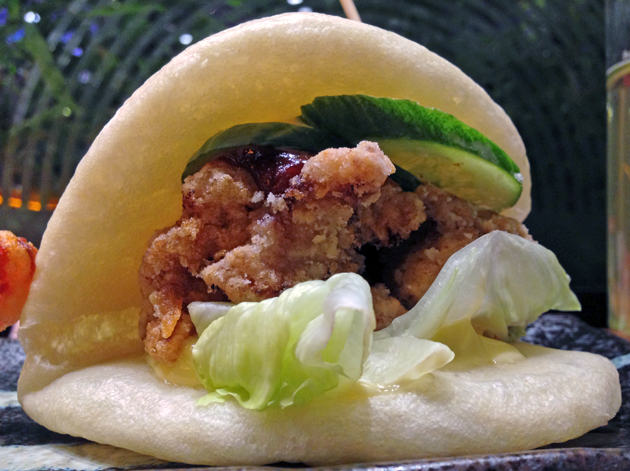 The chicken and soft shell crab fillings weren’t too bad as long as you keep your expectations in check, but the malformed buns make the Japanese Canteen a restaurant you can safely pass over when it comes to hirata buns. This residency inside the Bedroom Bar on Shoreditch’s Rivington Street is easy to miss if you’re not looking for it. Heck, it’s easy to miss even if you are looking for it. Although a Korean-style canteen, Korea’s past as a Japanese colony means Although a Korean-style canteen, oddly there are hirata buns on the menu. While a bit flat-looking, the buns are top-notch – soft, fluffy and slightly tangy. Although the beef brisket was sadly off on my Saturday evening visit, the savoury earthiness of the shiitake mushroom variant was greatly enhanced by some punchy hoisin sauce. The pork belly was a delight too – thick strips of mildly fatty, intensely porky fillet in a moderately spicy sriracha-based sauce. My only complaint about Jubo’s hirata buns is that they’re small, but that gave me a good excuse to try out some of the other dishes. 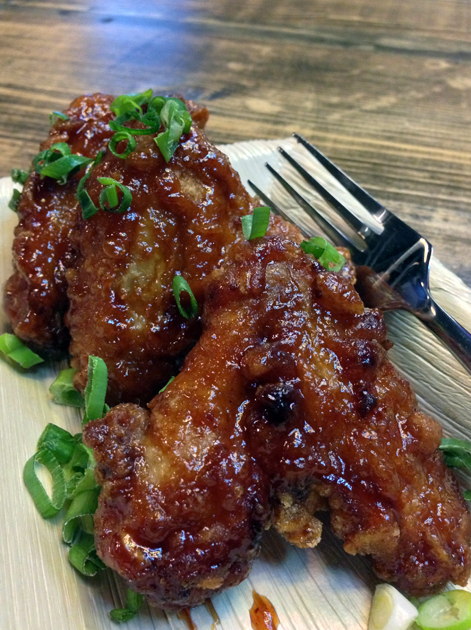 The fried chicken wings and strips were lacking in their promised soy garlic and hot and sweet flavours, but the incredibly crispy batter coating and moist chunks of milky flesh more than made up for this. The kitchen was so worried about the potential dryness of my steak bulogogi sub that the chef, unprompted by me, offered to replace it for free. Although the strips of beef were a tad dry, they were still perfectly edible – especially as they were coated in a earthy, lightly spicy sauce and then topped with cheese curds. The buttery brioche-esque bun was a perfect serving mechanism for this moreish Korean take on a Philly cheese steak sub. Although Jubo’s splendid hirata buns are on the small side, think of them as a gateway drug to this diner’s other fine dishes and you’ll be on the right track. Chinatown’s once-flagship Taiwanese restaurant continues its long, slow decline into mediocrity if its gua bao is any indication. The pork filling consisted entirely of a large, solid block of dull, unrendered pork fat. Even the peanut shavings and coriander were limp. Only the fluffy bun and the tart preserved vegetables made this cheeky piss-take of a dish edible. I’m not a fan of Shoryu’s ramen, so I wasn’t expecting much from the hirata buns at the new Soho branch. 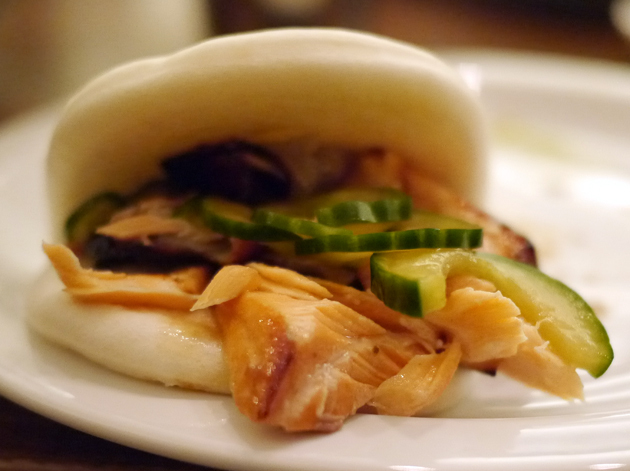 The large buns were surprisingly well made – soft, light, slightly chewy and a little tangy. However, the dominant tastes of the fillings tended to be of a spicy bean paste-like sauce and kewpie mayonnaise. I’m a big fan of spice and kewpie mayonnaise, but the flavours of both were too strong here and overpowered both the thin sliver of lean, moreish pork masquerading as pork belly and the lightly battered chunk of flaky salmon. If you squint, you can just about see the pork. Why does almost everything have to be battered and deep fried in some way? Only the very lightly battered, but thankfully oil-free, chicken karaage and mediocre prawn tempura fillings were resistant to the charms of spice and umami-esque kewpie. This was due to their sheer size though and not any standout flavours or textures of their own. There are glimmers of some good hirata buns at Shoryu, but the fillings need to be rebalanced in favour of quality, flavour-packed meat rather than cheap sauces. This market stall has settled down in a small takeaway premises next door to Rotary. If eating on the grim streets of Shoreditch is unappealing, there is a small counter inside, a bench outside and Rotary will let you eat your steamed buns at their tables. Yum Bun also continues to make occasional appearances at various street markets. All this may sound a little inconvenient, but it’s worth putting up with. The buns are exceeding fluffy and soft, with the thick, taut, slippery and tangy mushroom filling complimented nicely by walnuts and hints of ginger. The pork was a little too dry, but reasonably tender and pepped up by a mildly spicy bean paste and sriracha-based sauce. I keep mistyping ‘Yum Bun’ as ‘Yum Bum’. Freudian slip? The fried chicken filling was crispy and free from excess oil, if rather bitty. The meat’s moistness, the moreish batter and the lightly spiced mayo more than made up for this though. 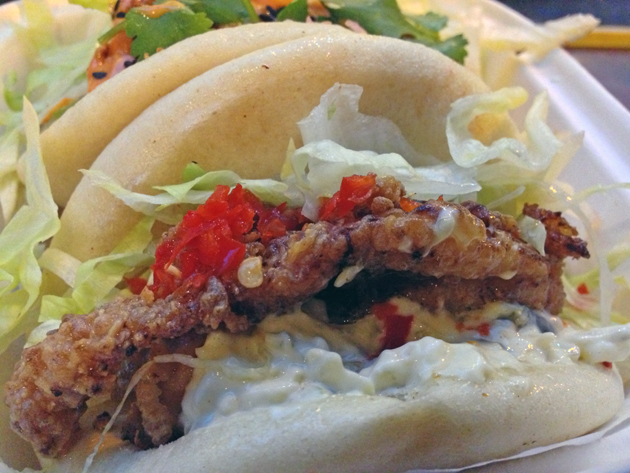 As good as the chicken and mushroom gua bao buns were, my favourite had to be the pollock special. The crispy, battered slices of flaky, salty pollock was complimented exceedingly well by the tart, lightly spicy and herby mayo. It was less like a standard mayonnaise and more like a well-crafted tartar sauce. They tried to rename pollock as ‘colin’. 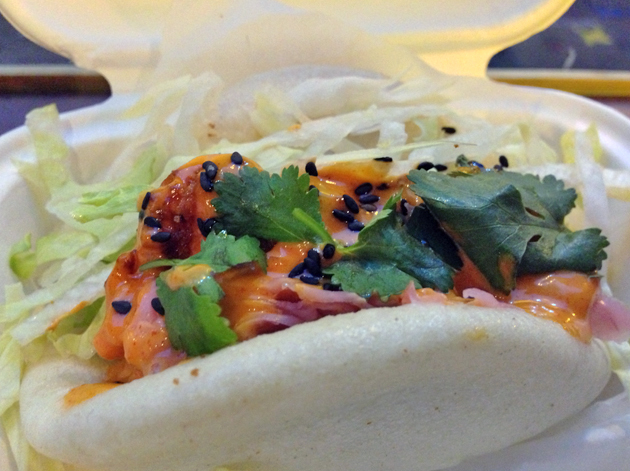 There were a couple of misses at Yum Bun, but the quality of the hits makes up for ’em. Flesh and Buns isn’t bad, but it can’t hold a candle to either of the two winners here. As with my recent round-up of American-style barbecue eateries, street food vendors continue to show how it’s really done. 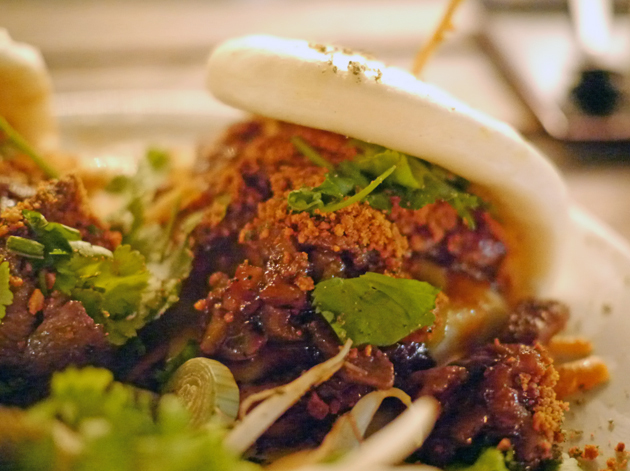 Yum Bun shows the way forward for gua bao fillings with a modern twist, while Bao London is the current champion of more traditional gua bao. I say ‘current’ as there’s room for improvement and I wouldn’t be surprised if gua bao/hirata buns eateries continue to flower across London. 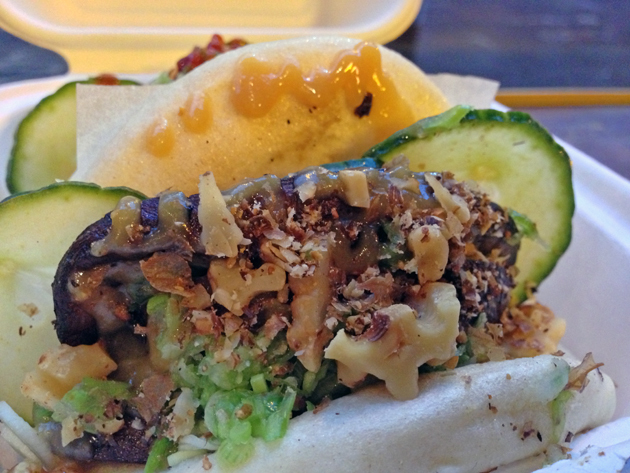 Tags: bao, baohaus, best and worst, bintang, bone daddies, flesh and buns, gua bao, hirata buns, japanese canteen, jubo, leong's legend continues, london, pork belly, restaurant, review, roast duck, sea bass, shoryu, yum bun. Bookmark the permalink. 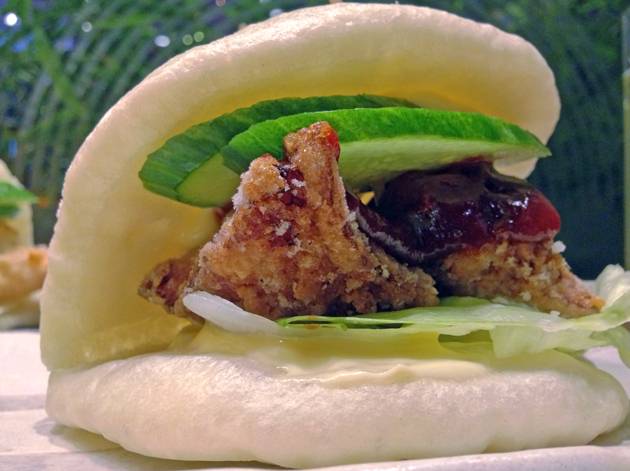 “Known by the Japanese as hirata buns due to Japan’s colonial occupation of Taiwan” ?!? 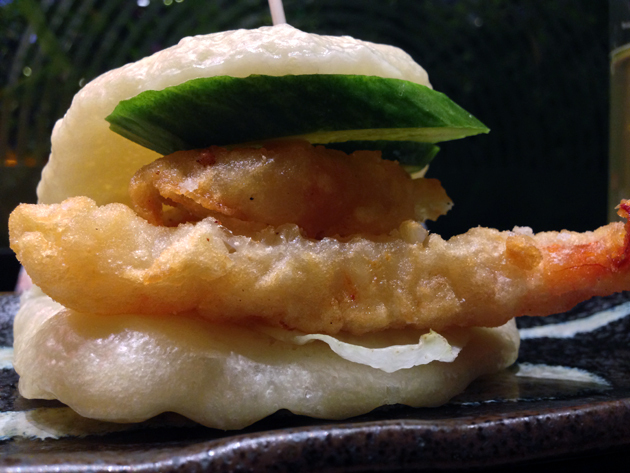 Most Japanese have no idea what is a “hirata” bun. 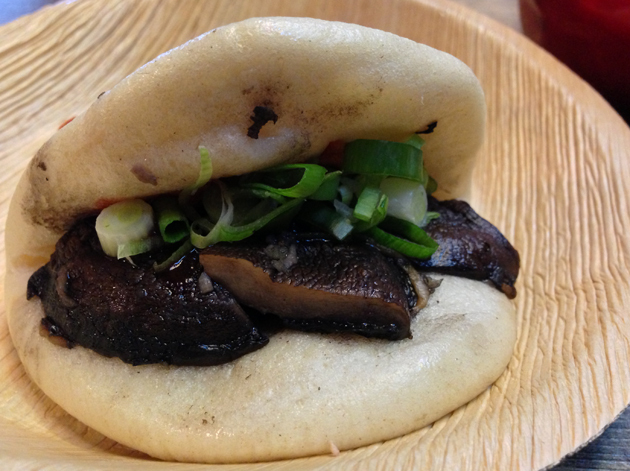 Gua bao were (re)named by the head chef of Ippudo New York after himself – Masashi Hirata, e.g. Thanks for pointing out my error. @tomroyal on Twitter has also pointed out that he’s never heard of hirata buns during his travels in Japan. I’ll need to be doubly careful when dealing with information reported elsewhere. 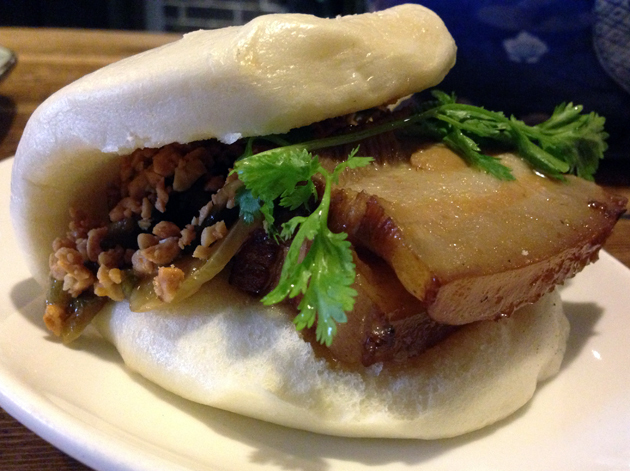 baowow.co.uk bristol…great gau bao there…. Well, I don’t know how reliable this article is when you mention that it’s a rice dough bun when it is so obvious that it is not. 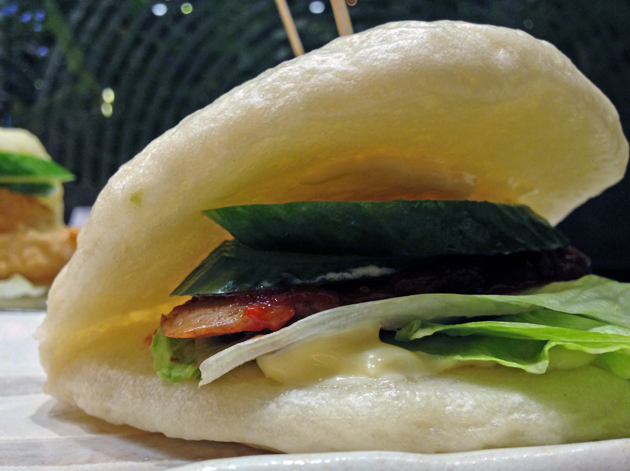 That first mention of ‘rice flour buns’ should read ‘rice or wheat flour buns’. Thanks for pointing out the omission. 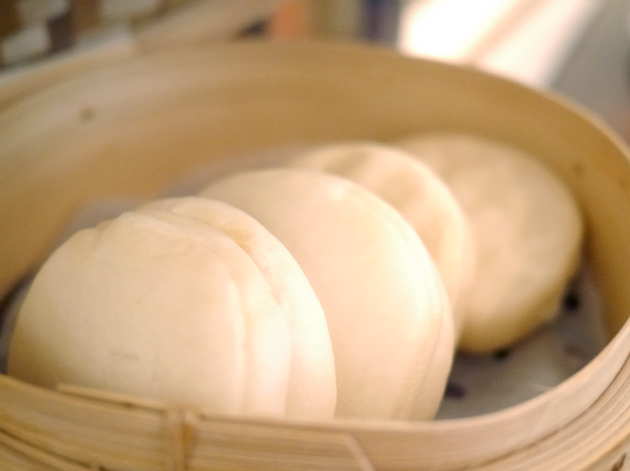 I’d also argue that a good rice flour bun is indistinguishable from a wheat flour one, but much, much more could be written about the best flour to use for bao.